Legoland Star Wars Days opened last weekend and will run Saturdays and Sundays through May 20th. We were on hand to experience opening weekend. Here is our photo review of this fun event to include Lego Star Wars Miniland, Star Wars Characters, Star Wars games, and Star Wars themed foods. The Event Guide for Legoland Star Wards Days listed showtimes, Miniland USA Star Wars experiences, photo ops, character meets, Star Wars Days Games locations and Star Wars themed foods available. Upon our arrival, to the Legoland Star Wars Days event, we were greeted by Stormtroopers. They were pacing above the check-in turnstiles and speaking to one another. Star Wars Characters were available throughout Legoland Park for meet-and-greet photo ops. Star Wars attire was recommended and we saw many fans dressed up as their favorite characters from the movies. Be aware that Darth Vader will attempt to whisper a message in your ear. Star Wars themed games and shows were available throughout the day. The Imagination Zone hosted some really fun and interactive games for children. Participants were given an event-specific Lego Brick as a take-home prize. We love the Stormtrooper representation on this Brick. Fun Town Theater hosted interactive shows, such as the “Galaxy of Fun Live Show,” that centered around the virtures of fun, creativity and unity. We tried a couple of the Star Wars themed snacks. The Blue Rey-Berry Ice Cream from Kingdom Cones was our favorite. We also enjoyed the Blue Light Sword Churro. Additional options were the Rebel Burger and the Light Side vs. Dark Side Ice Cream. Lego collectors are sure to enjoy the exclusive Lego Star Wars Scarif Trooper Mini available with a $50 Lego Star Wars Toy Purchase. Legoland Star Wars Days is an event that is great fun for the entire family. We were quite amazed at how detailed the Star Wars Miniland displays were. The themed shows and food options were limited, however, the character meets were plentiful and were our favorite part of the offerings. If you are a fan of the Star Wars movies, then you are sure to enjoy a visit to Legoland Star Wars Days. Are you planning a trip to check out Legoland Star Wars Days? Please leave your comments in the box below. 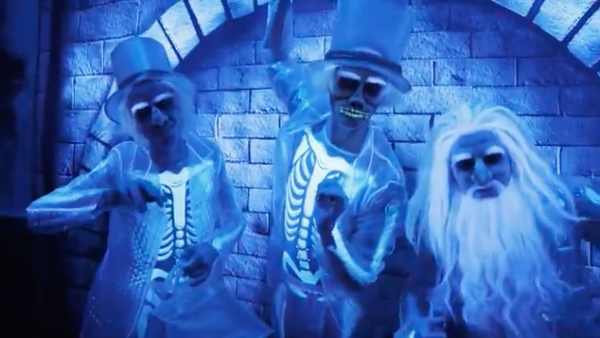 Does a Disneyland Haunted Mansion Meeting Venue Sound Hauntingly Perfect? !